Only Michael Jordan can continue to prove his doubters wrong and answer questions without words but actions. Yes his Air Airness is continuing to fly even if not often but when he does, it's still looks sooo graceful. 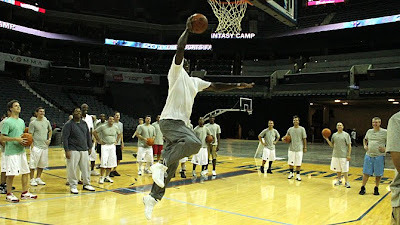 48 years old and oh what 8/9 years removed from the league and Jordan is still flying. He's been known to lace it up in team practices also. When asked by a camper at the Bobcats fantasy camp this week if he could still dunk, Jordan answered later in the day the only way he cold, by dunking. Now it was later in the afternoon when the dunk was performed so we don't know how much time he needed to warm up for the dunk but hey he dunked it and looked good doing it. Yea it's Jordan and it's still fun to see him fly when he does.